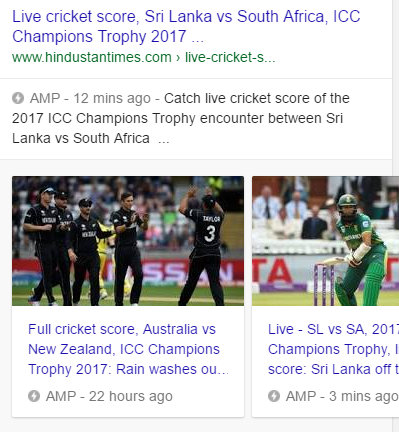 ICC Champions Trophy 2017 Live Score & Updates through additional carousels on Google Mobile Search! Another interesting modification in the Google Mobile search layout to incorporate additional information for users! 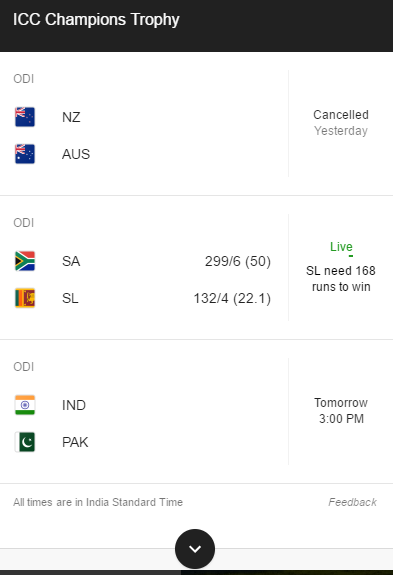 In the past, I wrote about HotStar's paid listing on Google mobile search for IPL 2017; that included a beautiful carousel providing updates on live score, match videos, etc. I observed something similar this time for the on-going ICC Champions Trophy. Cricket fans are well aware of this ICC event. For those who have no clue about the Champions Trophy, it is one of the biggest International Cricket Council's event that features top eight teams from the world. England is hosting the eight edition of ICC Champions trophy and this would be played from 1st June to 18th June 2017. 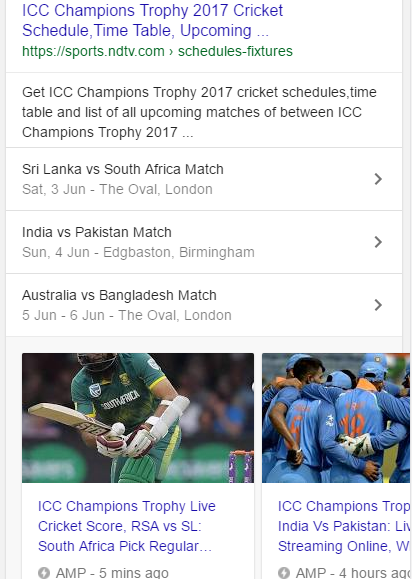 Coming back to the observation, if you search for 'Champions Trophy 2017' on mobile, you would first see a regular component of Google that provides you information on Champions trophy schedule and live score. If you scroll down you would see some other regular components like Top Stories and knowledge snippet (here from Wikipedia). But the most interesting part is the carousel from the Guardian. 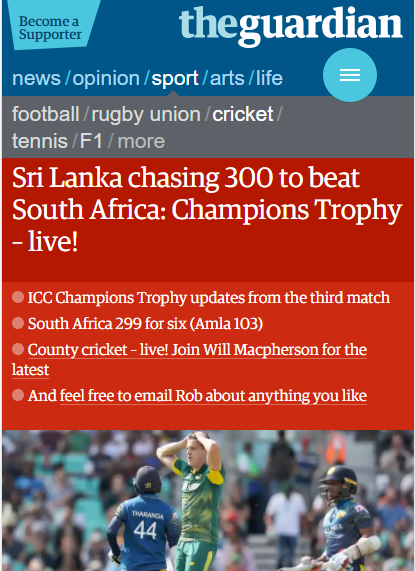 It provides live updates and appears only when a live ICC Champions Trophy match is going on. The components on this carousel are picked from the live feed page of the Guardian site. Above all, this listing comes with a 'Live' tag attached to it. This is termed as Search Live Coverage Carousel. Publishers can participate in this search live carousel pilot to notify Google when your breaking content is available. This carousel helps user find content related to live sports events, elections and breaking news. Breaking content can include videos, articles or live blogs. If you would like to register your interest for inclusion in the live coverage carousel pilot, you would have to fill the form provided here. Another interesting aspect we see nowadays on Google mobile search - organic listings for many sites with dedicated carousels attached. 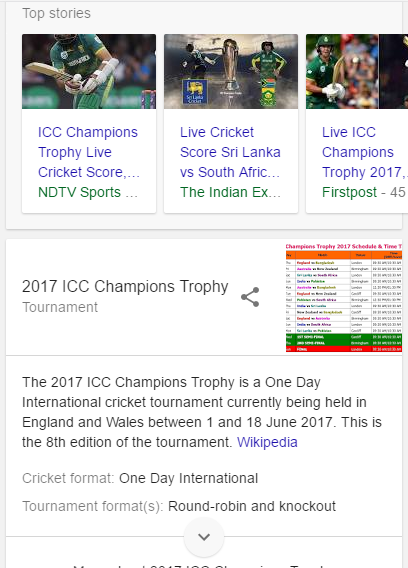 I could see as many as five carousels for the search query 'Champions Trophy 2017' on mobile! 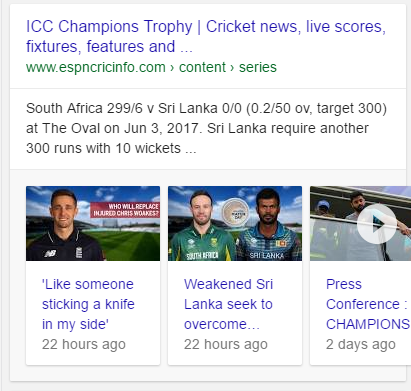 While ESPN Cricinfo seems to have got a mini-carousel with small components, sites like Hindustan Times or NDTV have got large carousels. Good to see some interesting changes in the mobile search layout again! 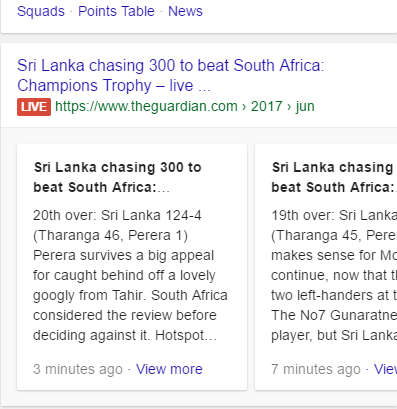 Here is a link to the video where I have shown how exactly the mobile results appear for the search query - Champions Trophy 2017.